We all remember the signature illustrations of our childhood reads: the wild scribbles of Quentin Blake, the gentle watercolors of Beatrix Potter, the simple line drawings of Shel Silverstein, and so on. Indeed, many book illustrations become indelibly linked to the stories they depict. And they’re not just limited to picture books! 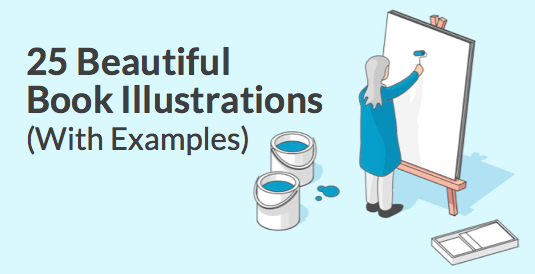 Many works of literature (both classic and contemporary) benefit from great illustrations as well. 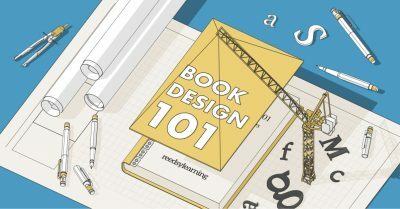 To help you get a sense of your preferred style — or if you just want to look through a gallery of gorgeous images — we’ve put together 25 examples of book illustration over the past few years. 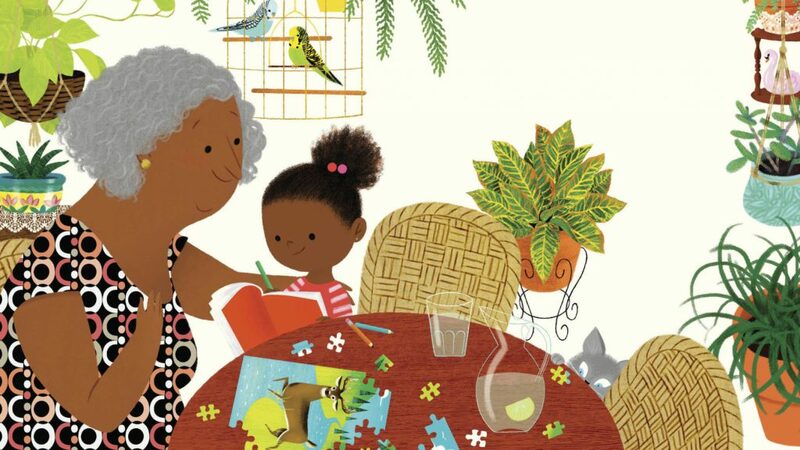 These drawings come from children’s books, graphic novels, memoirs, and more, with incredible diversity in both the subjects and the illustrators themselves. So whether you’re hoping to find an illustrator for your book or simply seeking a little inspiration, you’re sure to find something you love! For those who haven’t read A Fine Dessert, it follows four families over as many centuries — all of them connected by the preparation of the titular dish: blackberry fool. The story culminates in the modern-day gathering pictured above. Blackall’s intricate details add depth to the image — the crawling vine in the background, the fuzzy illuminations of the lanterns, and even the elaborate border of the tablecloth all contribute to the scene’s authenticity. 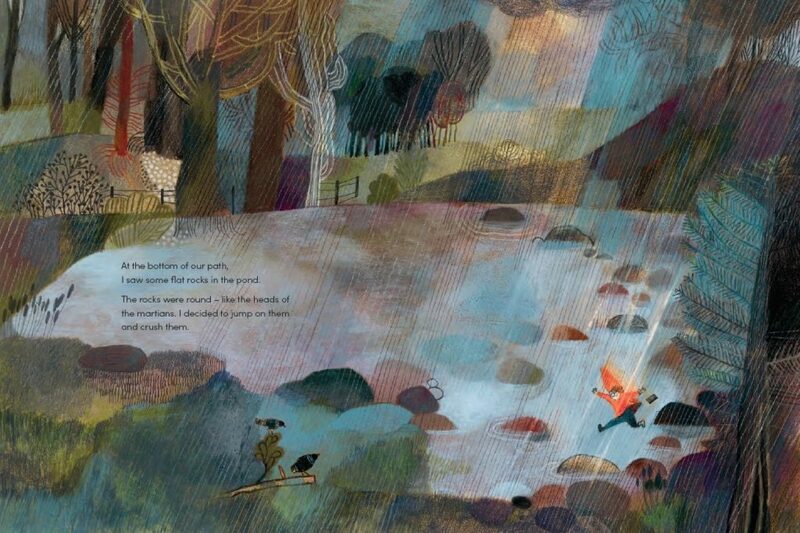 This illustration from Thi Bui’s A Different Pond is a lovely exercise in lighting. Bui masterfully demonstrates how to use color when painting a night scene, including some hues that you might not expect — such as the pale bluish-green of the hillside, which stands out nicely against the dark foliage. She also employs an unusual perspective here, positioning the leaves closest to us and the people further away, so we get a sense of observing from afar rather than following on their heels. 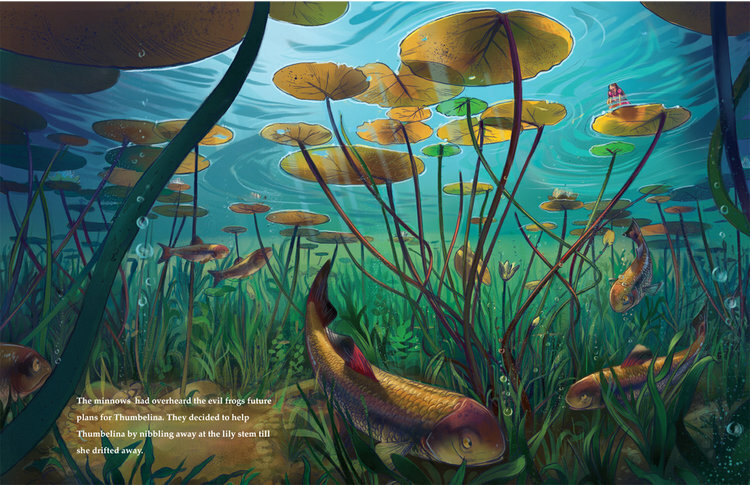 This illustration by Tamara Campeau depicting a scene from Thumbelina also features a pond, though from a very different perspective. Her marvelous use of color, from the pond’s cerulean surface to its dark green reeds, gives the impression of deepening levels, with a little less light filtering down to the bottom. Campeau also does an excellent job with texture in this drawing, as you can tell from the fishes’ scales, the slippery reeds, and the filmy-looking lily pads at the top. True to the title of this children's book, Beatrice Alemagna’s drawing style is undeniably magical. Her softly alluring colors and shapes evoke a dreamy landscape you wish you could step into, Mary Poppins-style. In this illustration, Alemagna even manages to make a rainy day seem idyllic — such is the power of her persuasion. Andy Catling specializes in cute, cartoon-style illustrations like this one. 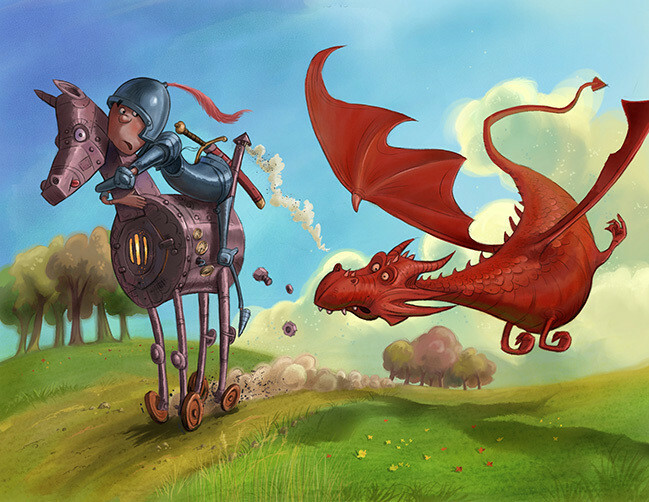 However, despite the somewhat implausible scenario, you’ll notice that he hasn’t skimped on the plausible details — such as the dragon’s perfectly proportioned shadow, the dirt and dust behind the horse as it skids to a stop, and the tiny blades of grass sticking up in the foreground. Though the bright colors and unusual shapes draw the viewer’s attention, it’s the little details that truly elevate this illustration. Dave the Potter: Artist, Poet, Slave tells the true story of David Drake, an African-American man who was a highly accomplished ceramicist, despite being enslaved for most of his life. 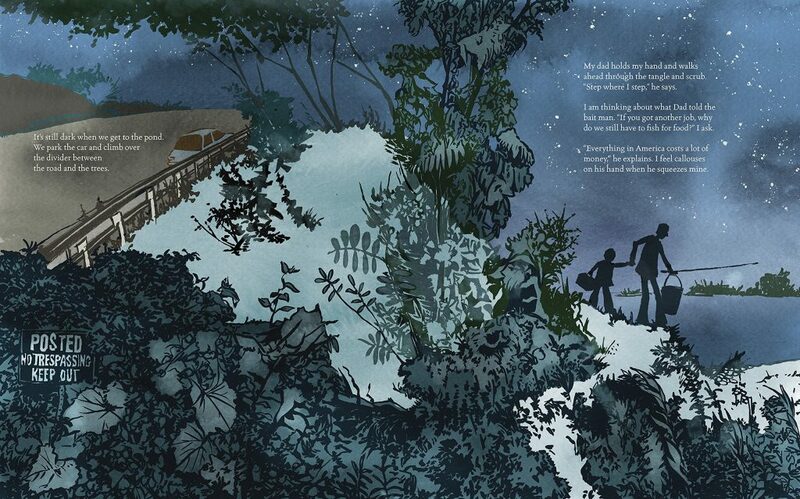 This moving work is accompanied by stunning illustrations from Bryan Collier like the one above. Collier’s style is marked by its vivid colors and exquisite detail in his subjects’ facial features. He tends to combine this human detail with collage-like backgrounds which, if not quite as realistic, are just as ornate — note the patterns of the land behind Dave in this image, and the faces that emerge from the tree’s bark. Interestingly, this illustration is almost the inverse of Collier’s work; as you can see, Leo Espinosa tends toward simply rendered figures and complex backgrounds. 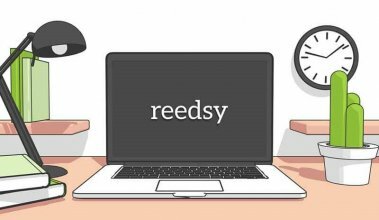 The perspective here is a bit skewed, which would normally create distance from the reader — but the inherent warmth of the characters nevertheless draws the eye toward them. The surrounding objects also provide context for Lola’s life, which is especially important in a book like this about family and culture. 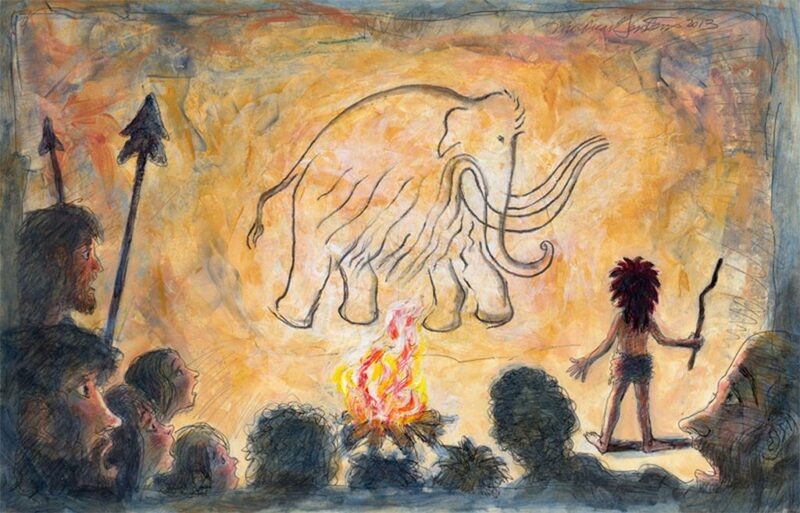 This illustration by Mordicai Gerstein, the titular “first drawing,” centers around a mammoth etched on a cave wall. But as with so many book illustrations, its true charm lies in the less-obvious details. For instance, notice how many colors and paint strokes make up the wall itself, giving it a look that reflects the flickering fire. There’s also a clear divide between the artist and his drawing, bathed in light, and the onlookers in the shadows who are on the verge of enlightenment. 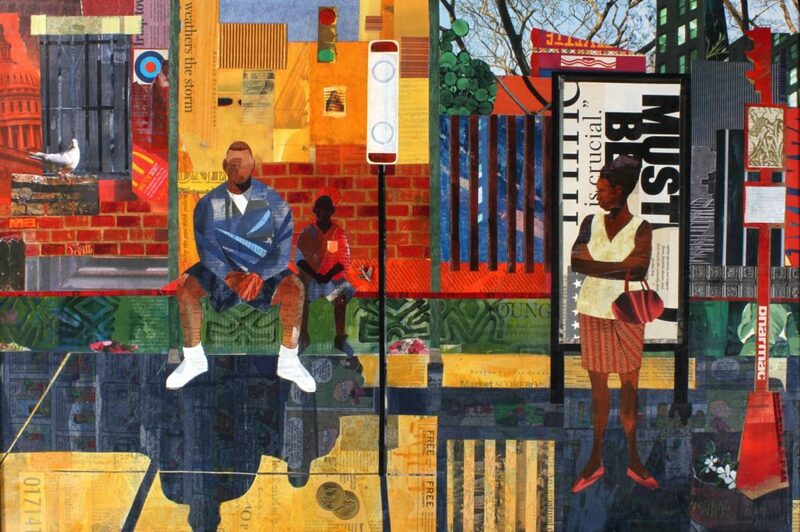 Ekua Holmes’ portfolio boasts some of the boldest, most dynamic illustrations today, such as this image called Bus Stop (not part of a book, but highly representative of her other work). Here we see a man, a woman, and a boy waiting for the bus. They’re faceless, but still emotionally charged: the woman, crossing her arms, seems impatient, while the boy and man seem relaxed. But Holmes’ true innovation is how she patches together the visual elements of this piece — paying tribute to the historical art of the Harlem Renaissance while infusing it with her own modern, slightly offbeat feel. 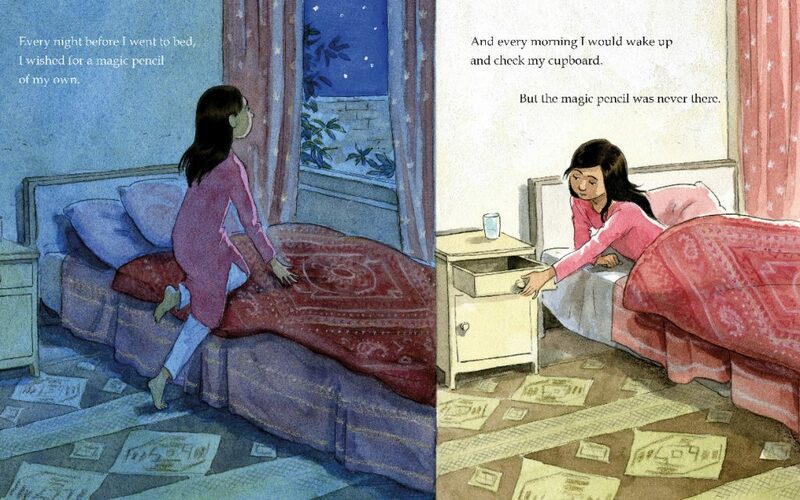 Malala’s Magic Pencil is an illustrated account of Malala Yousafzai’s life story, beginning with her dreams of using a magic pencil to change the world — and ending with her realization that she doesn’t need one after all. Kerascoët’s depictions of Malala’s life are wonderfully nuanced, with easily digestible images for children to enjoy, yet signaling deeper meaning in their details (such as the patterns of Malala’s bedspread and carpet in this image). Kurzweil’s graphic memoir Flying Couch will gratify fans of Alison Bechdel’s similarly styled “family tragicomic,” Fun Home. Here we see Kurzweil, her mother, and her grandmother: three generations of women whose diverging experiences come across in their poses and facial expressions. Kurzweil also chooses not to use color in her illustrations, which makes certain details stand out much more starkly. For instance, here it’s the tulips and the women’s darkly colored garments — Amy’s polka-dot shirt, her mother’s sensible pants, and her grandmother’s concealing sunglasses (all of which represent significant aspects of their personalities/stories). John Lee is incredibly skilled at creating illustrations that look elaborate and real, yet also retain a certain romantic haze; this drawing is a perfect blend of both sides. 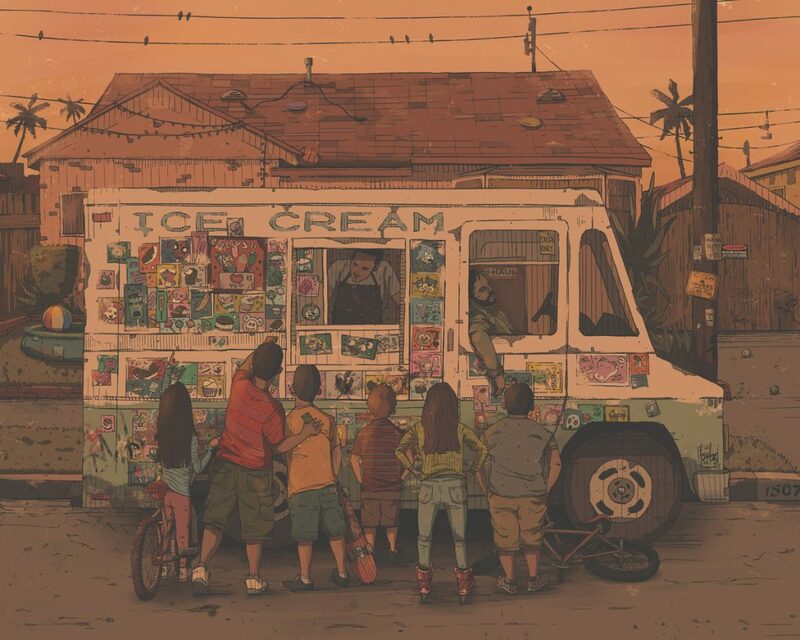 Every little detail, from the rough-looking pavement to the haphazardly plastered ice cream selections, looks absolutely authentic — but the picture is still cloaked in the glory of summertime sunset, producing a serious pang of nostalgia for those of us who chased ice cream trucks in our youth. 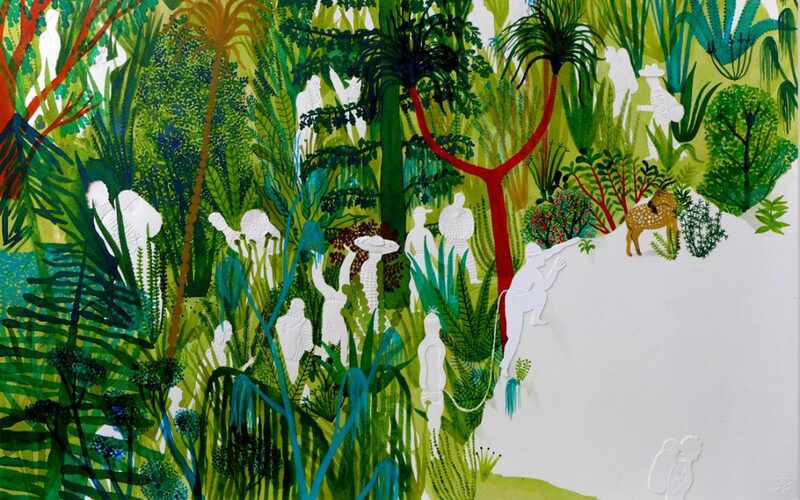 The magnificently vibrant illustrations of The Forest, jointly designed by Lópiz and Vidali, evoke a world in which people pale in comparison (literally) to plants. There are many different types of flora here, trees and ferns and other shrubbery, which demonstrate the need for eye-catching variety in scenery… as well as the importance of research when constructing such illustrations, as these artists likely had to look up exactly which plants they’d be drawing. We’ve all surely heard of Frida Kahlo, and this is far from the first biography to delve into her life. But Animalitos takes a fresh perspective by focusing on Kahlo’s relationships with animals, particularly her pet monkeys and birds. 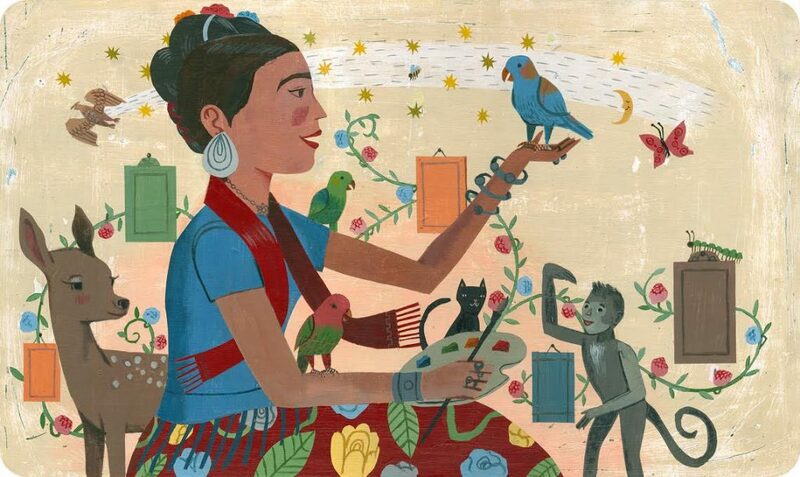 Parra’s colorful, scrapbook-like illustrations show Kahlo enjoying the company of her animals and connecting to them through her art — positive relationships that come across clearly in this drawing. 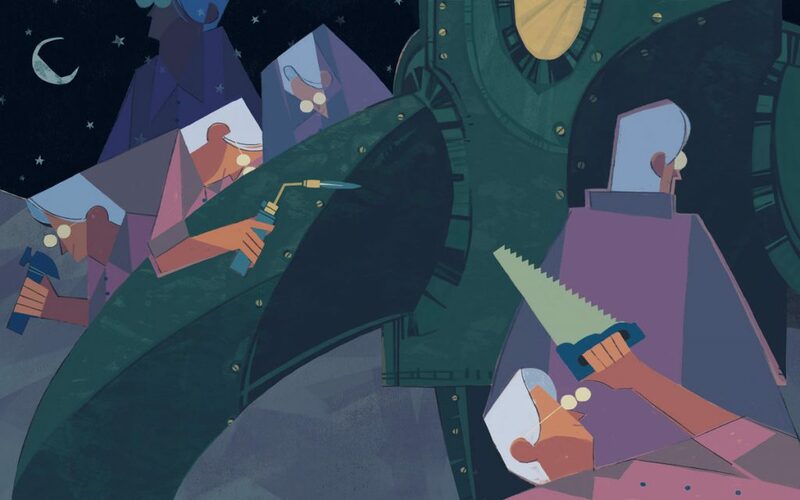 In this illustration of a short story by Ray Bradbury, Larsson McSwain conjures a Jet Age atmosphere in expert contemporary style: clean lines, appealing colors, and geometric figures that denote simplicity yet sophistication at the same time. 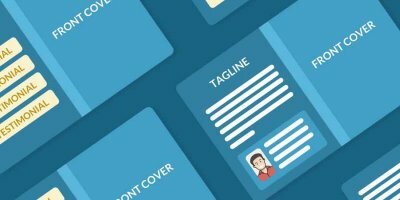 Indeed, you might expect to find a design like this on a Google banner or Facebook event theme (gotta love those FB party people). 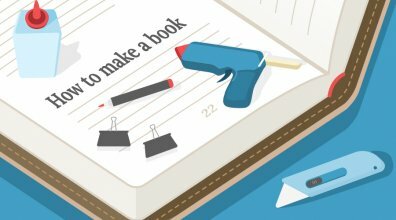 If you’re hoping to market your book through web-friendly illustrations, you can’t go wrong with this kind of style. Having illustrated for countless other authors throughout her career, Yuyi Morales struck out on her own with Dreamers — an autobiographical story of traveling from Mexico to the US with her young son, and building their new lives there. This evocative drawing presents all the emotions of her story in a single image: hope, fear, confusion, anticipation, and determination. Morales’ soft style also serves as a Trojan Horse for many complex ideas, not least of which is an unflinching political statement about immigration in America. 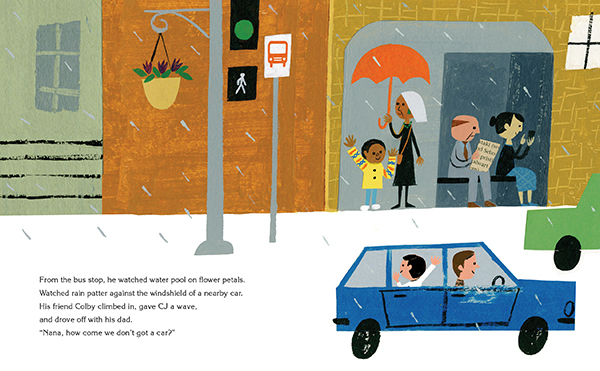 Last Stop on Market Street has been commended for its subtle, kid-friendly depiction of class divisions, to which Robinson’s illustrations contribute a great deal. This drawing involves CJ and his Nana waiting for the bus, as one of CJ’s classmates drives off in a car; though the scene and style may be simple, the message is profound. 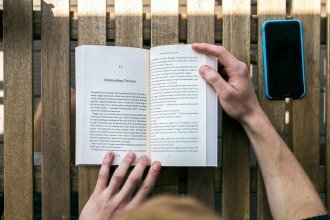 As the book progresses, CJ learns more about the world around him, and comes to deeply value its diversity. Coming from another illustrated biography of a famous figure, this snapshot of Joan Procter (a brilliant zoologist and herpetologist) portrays her happily hard at work. Sala’s drawing once again makes excellent use of perspective, employing a bird’s-eye view of Procter and her subjects, which Sala imbues with loving detail. The viewer also appreciates the astute parallels between Procter and the reptiles: she too is lying on her stomach alongside them, snacking on a sandwich as she feeds them lettuce. This illustration from Simmonds’ graphic novel Cassandra Darke shows the eponymous Darke, an embittered London art dealer, gazing out onto the streets of the city. Ironically reminiscent of cozy wintertime illustrations from children’s books (think The Polar Express and The Snowman), this drawing clearly conveys Darke’s contempt for her surroundings, helping us see it through her eyes. 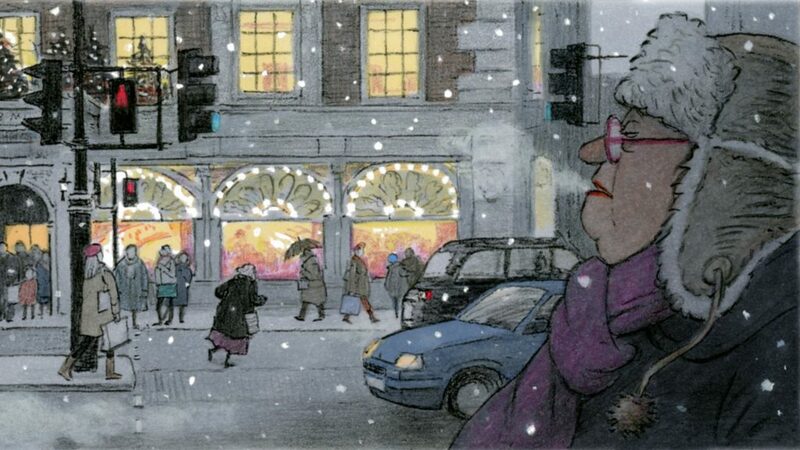 Yet Simmonds still manages to enchant us with the snow and warmly lit shop windows just beyond; a difficult balance to achieve in a single frame. The pointillism-influenced style and breathtaking use of color make this one of the most impressive works on our list. Looking closely, you can see that the patterns seem to have been created by bright, sponge-like imprints atop solemn black lines — a sharp contrast that’s also reflected in the jubilant feel of the overall illustration vs. the actual words on the page. Fans of Stevenson’s other works (Nimona, She-Ra) will immediately recognize her pointed cartoon style here. Note the simply yet subtly executed differences among the girls, from Jo’s sharp chin and protective hand on a friend’s shoulder, to April’s determined look as she leads the group. Stevenson has a way of doing a lot with very little, which is part of why her comics resonate so much with readers. 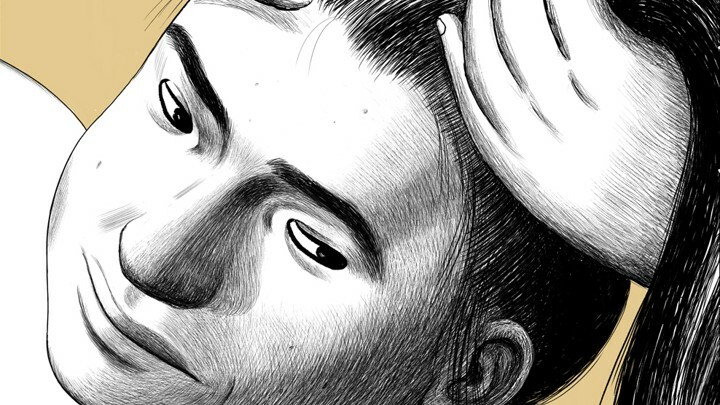 Boundless is Jillian Tamaki’s first short story collection, a unique combination of realism and speculative fiction, accompanied by her signature pen illustrations. As an illustrator for the New York Times, Tamaki knows how to express profound emotion and meaning through fairly simple images, and she uses that skill to great impact throughout Boundless. 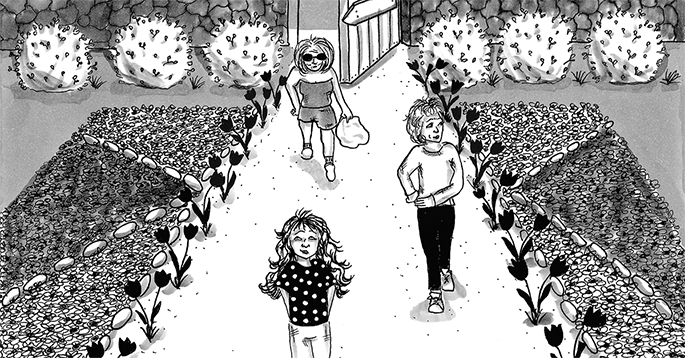 Telgemeier’s Cartoon Network-y style practically brings the pages of her graphic novel, Ghosts, to animated life. This image shows Catrina, the main character, coming face-to-face with her undead namesake, La Catrina. 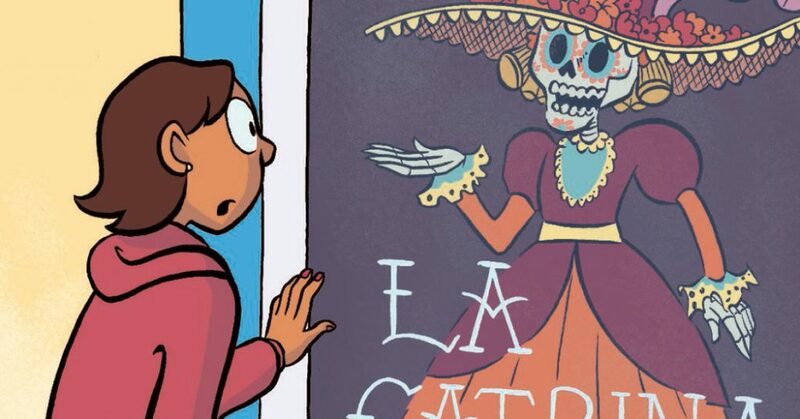 Again, Telgemeier uses a straightforward parallel to signal something greater; over the course of the story, Catrina and her little sister Maya (who is terminally ill) explore their Mexican heritage and the nature of death. How can you not love those wild-eyed seagulls (strangely familiar, are they not?) that perfectly represent this chaotic San Francisco scene? Evan Turk’s signature style is a touch messy, unfailingly colorful, and full of intriguing characters. But upon careful examination, you’ll find he’s more Klimt than cartoonist — Turk’s innovative blending of shades and shapes have established him as an experimental master. 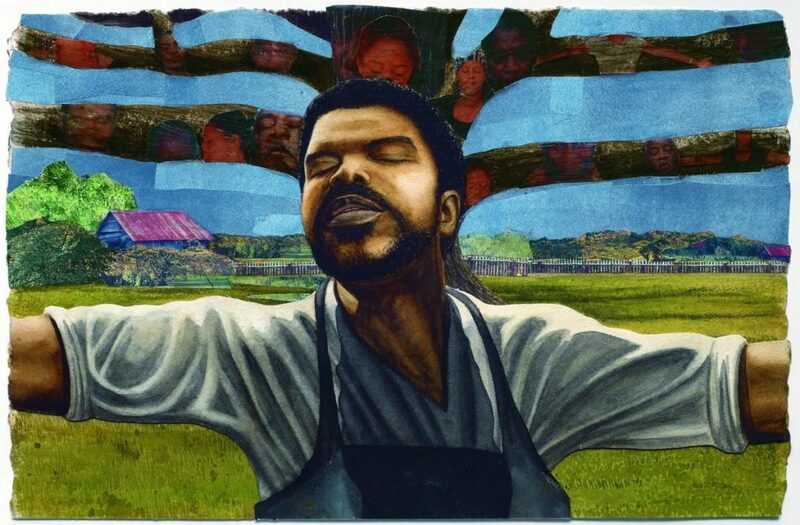 This piece by R. Gregory Christie can be found in Carole Boston Weatherford’s Freedom in Congo Square, which details the lives of slaves in nineteenth-century Louisiana. 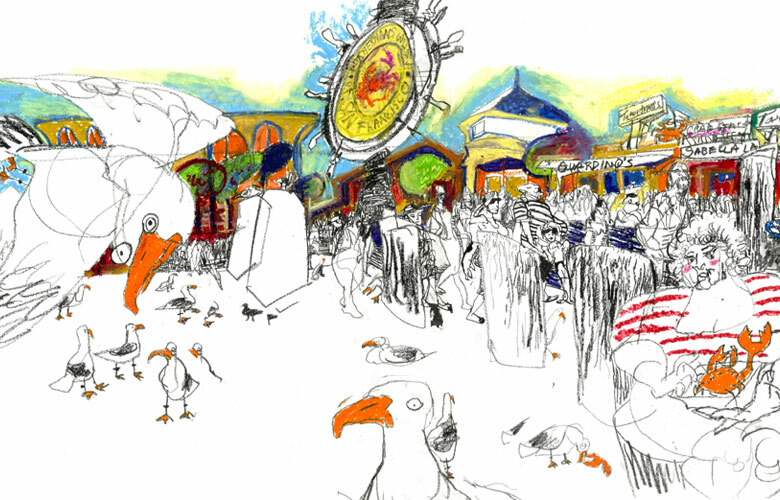 Each week they would look forward to a few hours off, which they’d spend celebrating in Congo Square. 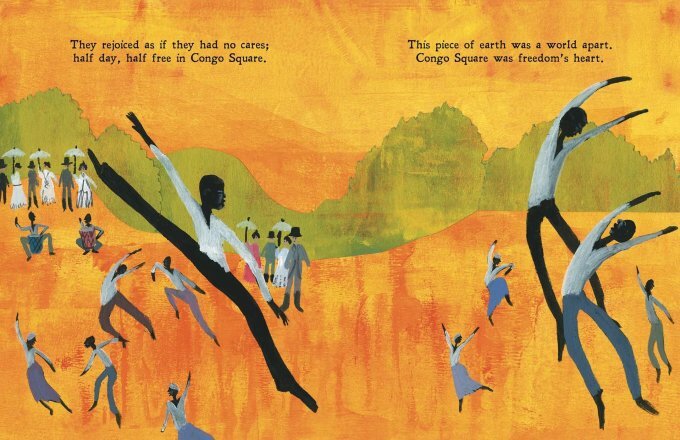 And though this work does an admirable job of not sugarcoating history, Christie’s striking illustrations effectively convey the three-dimensional lives of slaves: they were not merely exploited workers, but people who had their own culture, goals, and dreams, all of which were symbolized by their gatherings in Congo Square. What’s your favorite book illustration of all time? Let us know in the comments! Also, for stunning examples of book cover designs, check out this amazing gallery. 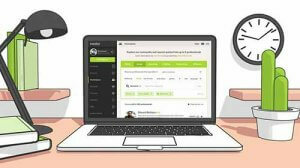 ← What is the Cost of a Professional Author Website? Sign up to meet 100+ of the top interior book designers in publishing.